Build your own unique custom flower arrangement by choosing the type of flowers, colours, quantity, and whether you’d like it in a bouquet, vase, basket or arrangement. If you want flowers that aren’t in the list, send us an email with your special requests. See detailed instructions in the description tab below. Important note: The minimum value for custom flower arrangements is R 300.00 + delivery, with a minimum quantity of 5 or more per flower choice. Arrangements below this value cannot be fulfilled. Create your very own personalized flower order with all her favourite flowers using our unique custom flower app. To get started building your arrangement, simply pick the flowers in the colours you would like by clicking the corresponding checkboxes, and enter how many of each flower we should put in your bouquet or arrangement in the Qty field. Next, select a style (Cellophane, Vase, Basket or Arrangement). Greenery and filler is included. As you select flowers from the list, the total flower value for your order will update to reflect the choices you have made. To see the updated price, scroll back up to the top. Click “Add to Cart” when you are done. If you are looking for specific flowers that aren’t included in this custom flowers app, send us an email with detailed instructions on what you are looking for, and we’ll do our best to accommodate your special request. 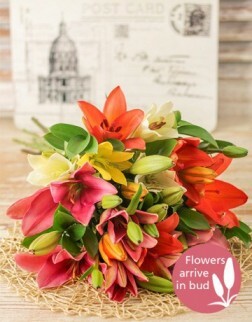 Our custom flowers are available for same day delivery in Durban if we received your order and payment before 12:00pm. See delivery restrictions tab for more info. I've just ordered flowers and am very impressed. The smooth way everything works from making a selection, to paying by card. Everything went smoothly and fast. What impressed me most was that I could put together a bunch of flowers of my own selection. I just wanted to say a VERY BIG THANK YOU!!! to Lizé & Salomé for the exquisite roses display basket, created for my Nans 90th birthday party and delivering it all the way to Pietermaritzburg on the same morning it took place. She was absolutely thrilled when she saw the beautiful red roses and still can't stop talking about them. You have truly out done yourselves with the amazing service and going out of you way to make that day as special as it could be. I needed a same day delivery for a bday present and was sweatin' it wondering if it would actually get there. - The flowers and chocolates were delivered within an hour or my ordering them. I needed it to be special and a touching surprise. - My mom-in-law was thrilled and so touched by the beautiful flowers.